This innovative solution has been the subject of a patent internationally and has been designed to overcome the technical and aesthetic constraints of the existing wall-mounting brackets. 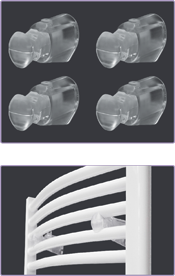 The objective Néomitis®: Significantly reduce the exposure time of the towel rails by strengthening security. Saves time for laying: 4 screws in all, one screw per wall-mounting bracket. Simple installation without additional tool. Intuitive adjustment of bracket in depth : 3 lockable positions to accommodate irregularities of surfaces. Correct assembly of control by direct visualization. Lock depth by self-locking pin and final lock installation by clipping. Transparency and sleek bracket make them almost invisible and highlight the towel rails. The shape of the wall base increases the adhesion of the brackets to the wall. Integrated compensator shock absorber : small silicone plug automatically compensate the differences between the pipes for a perfect fit. The mobile carriers and plugs provide a maintenance of towel rails by stable balance during the locking of the installation. High temperature resistance, deformation and wrenching. > Ready to use, just simply connect your towel rails to your central heating. Hydraulic Anthemys and hydraulic Danais have been specially designed to suit the requirements of central heating systems, and that, whatever the heat source: heat pump, condensing boiler... and the type of energy : wood, gas, solar. In new or renovation, our range bring you comfort and satisfaction! The central connector can prepare the installation of towel rails in advance, choice of dimensions and power can be made later. 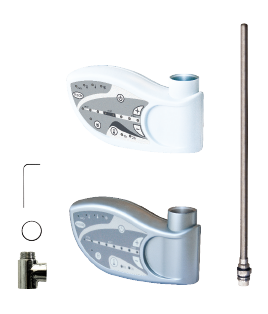 The center distance of 50 mm allows adaptation to the most system of configurations. > In renovation, limit piping through flexible hydraulic connexion ! Multiconnexions, hydraulic Anthemys and hydraulic Danais offer many possibilities of hydraulic connexions: the top, bottom or alternating. The towel rails is reversible (top and bottom) and easily adapt to the constraints of each installation. > Bi tubes connexion (standard) or single-tube (with monotube trim and injection valve, not included). 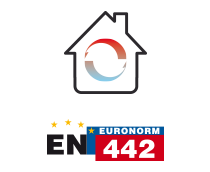 > The thermal emission of Néomitis heater body with hot water complies with Standard EN442 (At = 50K) which meets the requirements of the standardization of thermal power in the states of the European Union. > Hot water, primary energy is provided by your boiler. During the cold season, the boiler feed your radiators and your towel rails with hot water. > Electric Power, second power feeds a heating resistor inside your towel rails. This energy is used during periods when the boiler is off. > Traffic optimized fluid through special electrical resistors Mixed Kits with reduced diameter. For example: In mid-season, your central heating is off, you want to heat your bathroom and dry your towels. Mixed kits provide this function electrically. > Three models, the five powers, three widths and four heights allow perfect fit hydraulic Anthemys and hydraulic Danais to your central heating system and the volume of the room.